This is the sermon I preached last Sunday, 4/7/19 at St. Timothy Lutheran Church. The text was Philippians 3:4b-14. Today’s second lesson exudes God’s overwhelming grace. That grace called the Apostle Paul and turned his world upside down. God’s grace is poured out upon us to that we may grow and go to proclaim the good news to all. The last paragraph is a picture of running a race. I can identify with this because my son, Christian, ran from middle school into college. I have watched innumerable races all over our state. Together, let’s look at Paul’s running strategy as he competes in the race of living a life in and for Christ and others. The entire section is directed at those who thought they were already perfect and could not expect anything new from the future. First of all, Paul writes that he has not yet made it to the finish line. The beginning of the first two verses of this section express this in parallelism: he hasn’t obtained or already reached the goal and in the next verse he doesn’t consider that he has made it his own. Paul acknowledges he is not already fully alive in union with Christ in the resurrection to the fullest extent and that he has already been made Christ’s own. Believing that we have already attained what is still in the future can lead to carelessness, not attending to what needs to be done now in order to build a foundation for the future. We must remember that our present time becomes the past that holds the roots from which the future present will grow (Hearon). Paul’s life was hard and busy. He was in prison. Why bother spending so much time focusing on Christ and living for him? His motivation was, “because Christ Jesus has made me his own,” (v. 12b). Paul’s sense of acceptance by God energizes his continual pursuit of calling. Each race is different, with its own variables of heat and the elements. Is it a cross country race that’s being engaged in, indoor track or outdoor track? One runs differently in each, using different strategies for each. In cross country, for example, you don’t want to be in the lead early on. If you are, you’ll tire and won’t be able to sustain that pace. 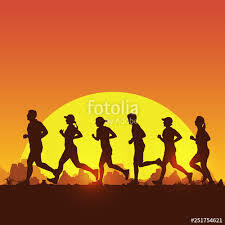 It seems to me that the race of the life of faith is more cross country or even more so like a marathon. There is more parallelism as far as what Paul is going to do about not yet having arrived; his strategy for the race. Faith for Paul involved running, wrestling, striving and fighting, which were ongoing until the day of Christ, at his return. None of his efforts were for brownie points, but rather to pursue his marvelous obsession of following Jesus and serving him wholeheartedly in the here and now. And what about the future? His desire was to be with Christ in the resurrection, at the end of time. To that end, Paul can seek, because he has been found; he can know because he has been known. Paul sought to lay hold of Christ, who had already laid hold of him. Paul’s faith and strategy for the race was goal-oriented. It consisted of three steps. Step one is “Forgetting what lies behind.” Jesus has redeemed Paul and us and bought us all a future with his love. Don’t get stuck in the past. If runners look behind them, they lose time or may stumble. Step two is to strain toward,” (v. 13b). Paul keeps looking forward. Moving forward with Jesus takes some work. Such work is for spiritual athletes. Step three is pressing on, “striv[ing] to lay hold” (v. 12b, New English Translation) of “the goal for the prize of the heavenly calling,” (v. 14). The Greek word translated “press on” had the meaning of chase, of hot pursuit, of even hunting down. Paul pursues what he has, yearning for it more than he could describe. It is an upward, (3:20) heavenly call, which continues to summon Paul to greater joy and love overflowing with insight and knowledge. Paul shows the Philippians what imitating the Christ who laid down his life for us looks like. It is a way to set aside the past to continue forward to what lies ahead. Nothing can distract Paul from the new and joyful pursuit of life in God by belonging to Christ. What is Paul’s prize at the end of the race? It is the “heavenly call of God in Christ Jesus” or in the Greek, the “prize, namely, the heavenly calling of God.” The Contemporary English Version calls it “the prize of being called to heaven.” Paul’s full knowledge of Christ, some of his empowerment through the resurrection and his participation in the resurrection of the dead are still future experiences. They compel him forward toward the prize in a race of grace. Paul is exchanging something he actually possessed, for something he might finally possess. He exchanges the past for the future, the past certain hope for future hope. As we go through this process, we will experience loss, usually the loss of the known, of what we own and what we have. We too, can lay everything aside for the superlative worth of life in Christ. In doing so, we engage in a paramount act of faith. So what do we get out of it? The same thing as Paul. What we gain is a vision for today that will not be fully ours until Christ makes us his own in the resurrection, in the future (Holladay). The joy and hope of falling and/or being in love is the best we can do to come near to the emotion in this passage. It is emotion that is both human and divine. Couples discover a love for one another that brooks no opposition. Parents fall in love with newborns which takes them into a new relationship of selfless, future-imagining love. And children love their parents too, though it is something they grow into, pressing on for a love that is already theirs and indeed has given them life (Henrich). So, how do we get there? Dietrich Bonhoeffer was a German Lutheran pastor, theologian and anti-Nazi dissident. His writings have become widely influential. The Nazis imprisoned Bonhoeffer because of his strong anti-Nazi stand and the accusation that he was part of a plot to kill Hitler. Only in his 30s, Bonhoeffer had great depth and understanding of spiritual things and their practical application in such a way that he was sustained by God throughout his imprisonment. The book The Cost of Discipleship has been described as a modern classic. Sadly, he was executed one week before the concentration camp he was in was liberated by the Allies. Lately, I’ve been reading from his book, Life Together, which is about living in Christian community which was how the seminary Bonhoeffer was in charge of in Germany was formed. The Scriptures are God’s revealed Word as a whole. The full witness to Jesus Christ the Lord can be clearly heard only in its immeasurable inner relationships, in the connection of Old and New Testaments, of promise and fulfillment, sacrifice and law, Law and Gospel, cross and resurrection, faith and obedience, having and hoping. That is why daily worship together must include a longer Old and New Testament lesson besides the prayer of the Psalms. A community of Christians living together surely should be able to read and listen to a chapter of the Old Testament and at least half a chapter of the New Testament every morning and evening. Now I realize we are not living together in a structured community of faith. However, there is certainly something we can take away from this great martyr’s words. They have certainly compelled me to spend more time in prayer and reading the word of God. The realization of how much we are loved, of how much God continues to long for and invite our growth in love, most of us don’t take enough time to experience that. All of this is very nice and may help us feel good, but what does it have to do with day-to-day life? For one thing, it means that we are being changed. In this case, change is good. If we look honestly at ourselves, warts and all, there is plenty of room for change, isn’t there? Do we find ourselves being short-tempered with friends and family? I hate to admit it, but it happens to Ray and me. I can get overtired and grumpy, like we all can. But if we allow the love of God to permeate our hearts and the grace of God to carry us through the race, we will find that we are being changed. Not only will we be a better family member who is more pleasant to be around, but this overwhelming love and grace of God will impact other areas of our lives as well. Some of us are overwhelmed with work. For younger families, there’s the harried pace of kids in school and all the expectations that comes with as well. Our granddaughter, Grace, was in a play at her high school. For her folks, that meant a lot of running around, picking her up after rehearsals, making sure she had something to eat as there were times she didn’t get home till close to her bedtime. If there’s more than one child in the family, then this is compounded. The nerves of tired parents fray. Allow that love and grace to wash over you as you whisper a prayer for strength. As our lives are changed through a more intense relationship with God, those outside of our families will see that something is different. If we are still working, we will see an impact there. In our community, as we interact with those around us, it will show. We are called to life together for each other’s good. As we together give ourselves to various community concerns, we can make a vital impact. Just look at all the bins of food that were collected while Kristie and Kathy were away! This is but one example of the natural progression that comes from running the race of faith in Christ. But there is so much more ahead for us. We have relationship with God, relationship with each other and relationship with our community and that changes not only our lives but all those around us. What could that mean for St. Timothy? Paul’s story provides a paradigm of the gospel, how the gospel works in producing a changed view of life and a renewed attitude toward the future. It is through prayer and the scriptures, by the power of the Holy Spirit, that we will grow into all God has in mind for our lives individually and corporately as the people of God at St. Timothy. This passage, as part of the story of Paul’s life invites us to see ourselves in light of the divine story—the center of which is Christ’s story. Here are some images to help us remember to keep growing and going in grace. (There were several images of runners that I had put on the screen with the music from the movie "Chrariots of Fire" playing in the background).